The soundtrack to Fez officially released on Friday, at a pay-what-you-like price (with a minimum of $7). 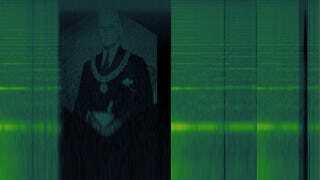 Because the entire game is a riddle, wrapped in a mystery, inside an enigma, some enterprising folks went and opened the sound files in a spectrogram and, voila, they found even more clues. Or they're Easter eggs, or some other kind of secret stuff. Fez is a very cool game. Tina&apos;s review neatly sums up many of the things that make it so good. This GameFAQs forum thread is shot through with surprises folks have found, all of it hidden at the end of tracks. Pictures, numbers, Jesus, Harry S Truman (above), all could be nonsequiturs, or they could be clues from the game's creative staff or from soundtrack composer Rich "Disasterpeace" Vreeland. Who knows. One of them looks like QR code, which it is. Sal Cangeloso of geek.com scanned it with his smartphone and found a series of years, from 1955 to 2005. Cangeloso suspects it could be the birth dates of the development team and their children (or parents, I suppose). I simply have not played enough of the game to hazard a guess at what any of it could mean. But it's pretty neat and, if you have the tools to bring this stuff to the surface, interesting to contemplate. This guy, at GameFAQs, supplies a detailed deconstruction. If you don't have the necessary applications, worry not, there are two Tumblrs that have pulled out several screenshots of the hidden content. They are listed below.